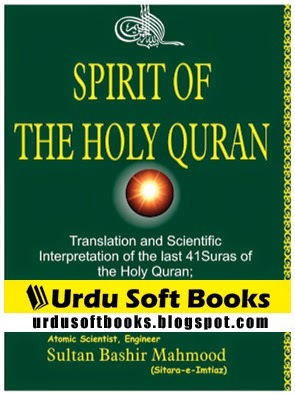 Download Free PDF Book "The Spirit of The Holly Quran" This book is written by Pakistan's famous Nuclear Scientist, Engineer "Sultan Bashiruddin Mahmood" (Sitara-e-Imtiaz). Writer already wrote more then 15 books on various scientific, spiritual, and Islamic topics. This book is based on translation and scientific interpretation of last 41 Suras of the Holy Quran, from Al_Muddathir to An-Naas, in the light of contemporary knowledge and problems. You can download free pdf book from below link. You can download Urdu Books, PDF Books from each page of this blog using below download link.